Cadet's mum has urged his fans not to keep "pent up anger" inside them at a tribute event to his life. Fans gathered in Hyde Park in central London to release balloons to celebrate the 28-year-old on Sunday.The rapper was the passenger in a taxi when he died in a car crash on Saturday morning.His mum said her son's life was "not in vain" and she was proud that he'd been able to influence so many people to achieve their goals.Speaking to the crowd, she said: "I'm so proud that his music has touched you in whatever way, enough for you to come out. "It gives me so much pleasure." 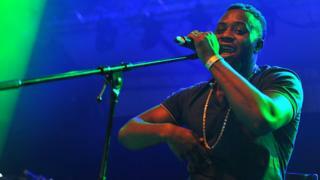 The rapper from south London, whose real name was Blaine Cameron Johnson, was on the way to a gig at Keele University in Staffordshire when he died.His mum said her son had been able to touch people's lives and "influence you to do and achieve whatever you want to".She added: "I need you men to express yourselves, express your feelings. If it's not to your mothers, to somebody. "Don't keep pent up anger inside you. It's not good. You become anger and anger portrays others things. Release it, even if it's in tears or whatever. "I want peace and harmony. "Cadet's cousin Krept - of rap duo Krept and Konan - also spoke at the memorial and urged fans to resolve any issues they have with loved ones.He and Cadet had fallen out when they were younger but had made up and had recently worked together. "I am so glad that me and him were able to resolve our situation before this happened," he said. "If I didn't it would've eaten me up for the rest of my life. "Cadet's kindness has been brought up my many of his friends.In a tribute on Instagram, Stormzy wrote: "This man exudes love. I can't even explain how clean-hearted you are, look what you mean to everyone. "No-one will ever forget you big bro, words can't do anything justice right now. "Cadet's most recent single Advice, with Deno Driz, was released in October and peaked at number 27 in the UK chart.He was due to perform at Wireless Festival in the summer and organisers say his slot will now include a tribute to his life.Follow Newsbeat on Instagram, Facebook and Twitter.Listen to Newsbeat live at 12:45 and 17:45 every weekday on BBC Radio 1 and 1Xtra - if you miss us you can listen back here.